Steve demonstrates the crocodiles strength from a safe distance. to let you know you will always be strong and your dad is always with u in your heart and always remember that and u are the bravest girl in the world and i am your biggest fan and you are so pretty and always remember that okay??? My true hero you are amazing. Just keep on fighting. One day it will pay off. Bindi is soooooooooooooooooooooooooooo cute an i luv you Steve. R.I.P Mate. We love you forever Erwin and your family! !God bless your children.Your works will be treasured!! Steve was a very strong and brave man. Someday i know you will follow in his footsteps Bindi! You are a strong girl! Bindi i love you. your dad is my hero and always will be and you inspire so many people to go on with their life knowing it will be ok. stay true to who you are and go the distence. I know you will be as great as your dad one day. I think that this photo shows Steve's love for Bindi. He was/are my great idol! 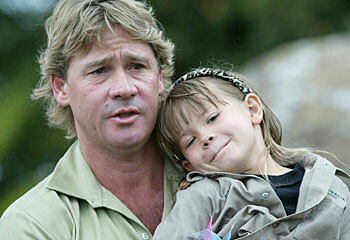 i think that steve was a very good person and a good farther.i hope that bindi will carry on his good work. This picture, personally represents Steve and Bindi's relationship. His face is upset because he has left behind his daughter. But Bindi, being the sweet heart she is, has some positive outlook...and she is trying to cheer Steve up. You can possibly not love them.